If you can’t fight chocolate cravings, researchers from University of Innsbruck in Austria have a suggestion that you can try. And don’t worry, it doesn’t involve taking in some nasty pills or locking yourself in your room all day, away from chocolates. Chocolates have everything we could ever want from a treat – sweetness, rich flavour and tempting aroma. There’s no wonder why we often can’t say “no” to chocolates. Once you grab your first candy bar, expect to reach for the second. 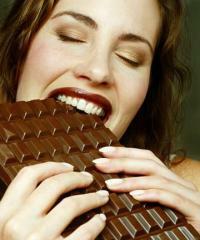 Chocolates are simply so impossible to resist sometimes. But without being mindful, sweets can take a huge toll on your health and add more inches to your waistline. The new research, published in the journal Plos One, reports that a 15-minute walk can reduce sugary cravings, even in people who are overweight or under pressure or stress, even if they are literally holding a piece of candy all throughout the stroll. According to lead author Larissa Ledochowski, going for short bouts of physical activity can be helpful in reducing junk food cravings even at times when an individual may be particularly vulnerable. The study involved 47 overweight adults with an average age of 28. They were instructed to refrain from eating sugary snacks such as chocolates for three days prior the experiment. In the laboratory, the participants were randomly assigned to one of two groups. The first group took a 15-minute walk on a treadmill. They were asked to walk briskly but not to the point that they were almost running out of air. The second group was simply instructed to sit quietly for the same period of time as the first group. All returned to the lab on another day within a week, and were assigned to the other group. After sitting quietly for five minutes or more, the passive group completed a test which is used to elicit high levels of stress. Afterwards, they were offered a selection of high caloric, sugary snacks. Participants were asked to unwrap the sugary snack of their choice and hold it for about 30 seconds, without eating it. Whilst doing the task, researchers recorded the subjects’ level of craving and emotional arousal, along with their heart rate and blood pressure. The researchers found that whilst the test increased all the participants’ stress levels, the food cravings were less in those who took a short walk than those who simply sat down and did nothing. Similarly, opening and handling the snack pumped up cravings in the inactive participants more than it did among those who took a short bout of physical exercise. "The findings of this study support the idea that a single bout of exercise can reduce cue- or stress-related cravings," the researchers concluded. So the next time you find yourself craving for more sweets, instead of going straight to the store, take a 15-minute walk around the block. The next thing you know, the food craving is gone. ©Copyright 2013 by http://www.naturaltherapyforall.co m Hypnotherapy Preston All Rights Reserved.